Orange paint marks the spot on the second level of the Alewife T station parking garage where a vehicle was hit by falling concrete on Wednesday, Aug. 8. For years, regular Red Line users of the MBTA’s largest parking garage have complained the structure was deteriorating. 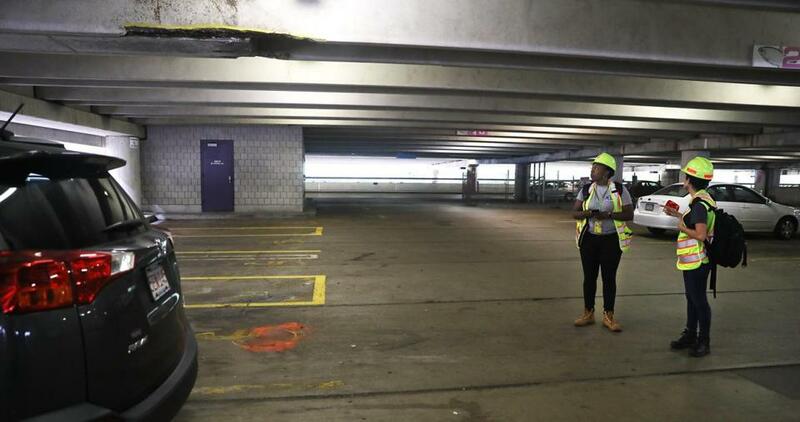 The Massachusetts Bay Transportation Authority said it is closing the entire Alewife parking garage in Cambridge this weekend as it continues repairs and inspections that had closed off about 500 spaces Thursday and Friday. The repairs began after a chunk of concrete fell on a car Wednesday. No one was injured, and at the time, the agency said the garage was safe for use. But on Friday, officials said they “found additional areas of deteriorated concrete that need to be addressed,” months after a consultant hired by the MBTA issued a report warning about “imminent” risks in the garage’s condition. Officials said the garage is not in danger of collapsing. Red Line service will operate as normal this weekend, and while officials promised “to limit the closure and minimize the inconvenience,” MBTA spokesman Joe Pesaturo declined to say if the garage would open for the Monday morning commute. Opened in the mid-1980s, the garage holds 2,600 parking spaces when fully operational. It is another example of the dilapidated state of MBTA infrastructure, which state officials pledged to repair and modernize after a series of winter storms in 2015 crippled the transit system. “It’s just really a tragedy that they have allowed a facility like this to get in such decrepit shape,” said Edward Strachan, a Groton resident who parks at Alewife three times a week. As with malfunctioning subway cars, problems at the Alewife garage had begun to appear long before the T could fix them. Some riders who have long noticed potholes, crumbling concrete, and exposed rebar say this week’s problems felt like they were a long time coming. Thomas Davison of Arlington said he and his wife have parked in the garage as part of their daily commutes for about two decades. He complained that the T has taken a “shortsighted, Band-Aid” approach to fixing the issues. “There’s [temporary hydraulic] supports everywhere throughout the garage,” he said. Indeed, in late 2017, a T consultant rated the condition of multiple parts of the garage as risking “imminent failure” and recommended “immediate corrective action,” even though the T had already been completing smaller-scale work on the garage for years. “In general, our investigation revealed moderate to advanced levels of deterioration in the primary concrete components of the parking garage. Others previously identified a few isolated areas with a critical level of deterioration. These have temporarily been shored,” engineering firm Thornton Tomasetti said in its report. In response, the T began soliciting bids in July for a broad range of repairs to the garage. On Thursday, the day after concrete fell from above, the agency hired a contractor to start the $5.7 million job in September. The work will include repairing beams, patching concrete, and clearing the garage’s drainage system, according to the T. A maximum of 120 parking spaces will be taken out of commission during that work, the T said Friday. Meantime, the agency is doing quicker “spot repairs” on deteriorating concrete. Pesaturo said the nine-month lag between the consultant report and the contract for the garage work was appropriate. Even still, Davison, the commuter from Arlington, said the public should have been warned about the consultant’s findings. Jan Devereux, a Cambridge city councilor, said she was not aware of the problems with the garage’s condition until this week. The upcoming repairs are unlikely to fix the garage for good. The T has said this work will merely allow the Alewife garage to stay open as it develops a “long-term plan” for the site. Alewife is the northernmost station on the Red Line. The garage fills quickly every morning, drawing thousands of commuters from the north and west who use it to access the Red Line. The garage is more than 30 years old, but younger than the 41-year-old Quincy Center T garage was when it abruptly closed in 2012 because of problems that included deteriorated concrete. The Quincy garage has not reopened. The MBTA has retained a private company to redevelop the property, including a parking garage at the busy station. Despite its poor condition, the Alewife garage is also slated to become the most expensive in the T system on Sept. 1, when rates increase from $7 a day to $10, under a new policy to charge more for the busiest parking lots. The T has not said it will suspend the parking fee because of the garage’s troubles.